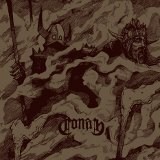 After a couple years, Conan is back with another helping of their crushingly heavy doom. I'd been waiting for the followup to their last release, Monnos, a lumbering, rough-hewn beast of an album, and this new one, Blood Eagle, is just as heavy as its predecessor, but faster and more agile, with a greater emphasis on riffs -- all of which make this one even better than the last. The cover, depicting a faceless armored warrior holding an enemy's severed head in one clenched gauntlet, sums up the album quite nicely. This isn't a traditional doom record; it's got some drone in its pedigree, calling to mind Earth, though it doesn't ever let the drone influence stand in the way of writing a good riff. Crown of Talons starts the album off with a deep, slightly buzzing distortion from significantly downtuned guitars. The guitar/bass combo is deceptively rude and primitive, ready to manhandle the listener at the slightest provocation; the drums are simple and slow; and the vocals are rather strange to someone who has not heard their albums before. They consist neither death-metal growls nor the clean, solemn intonations of a traditional doom vocalist, but rather a sort of harmonized, melodic yelling, courtesy of guitarist and bassist Jon Davis and Phil Coumbe. Total Conquest runs a little bit faster, with some even deeper riffs that sound positively subterranean, while Foehammer starts faster still, with a galloping beat like a charge of war elephants into battle. The low and phase-shifted tone of the guitar, plus the fact that the drum kit and bass is so front-and-center in the mix, gives a couple of these songs passages in which the individual notes of the main riff almost disappears, replaced with a steady pounding that is more felt in the bones than heard. They switch things up a bit to give Gravity Chasm a swinging, traditional doom beat, but there is no sign of an instrumental break like they put on Monnos. By the final track, Altar of Grief, the band returns to a grim and trudging slowness with the verses punctuated by big, blocky riffs, moving on several minutes later to a quicker pace. The songs seem to be slow, unsophisticated things at first, but like the band's namesake, the songs' brutish appearance belies a clever and inventive interior. After hearing a single riff battering at one's ears over and over, a different one puts in an appearance when it is least expected, all to the rumbling background of that deep bass/drum combo. Blood Eagle took all the greatness we saw two years ago on Monnos and gave it some steroids and a speed boost. There are no weaknesses on these new tracks, neither in songwriting nor in heaviness, and anyone with a taste for the extreme, slow, and crushing will greatly enjoy it.